These beautiful falls are located in the Chattahoochee National Forest and are readily accessible for the price a few dollars and a little bit of hiking. The water cascading over the drop offs is created by two creeks. The Curtis Creek falls drop 153 feet and the York Creek falls are a much shorter but still spectacular 50 feet. 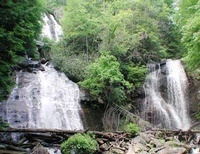 The water at the bottom of the falls is then considered to be part of Smith Creek which flows into and forms Smith Lake - the centerpiece of Unicoi State Park. To get to the visitors center you will need to drive through Unicoi State Park (driving directions). Unfortunately the fees for the Anna Ruby Falls Recreation Area and Unicoi State Park have nothing to do with one another. If you want to visit both places, you have to pay a fee at each one. If you are only visiting the falls you are allowed to drive through Unicoi State Park for free. Once you drive through Unicoi Park you will enter forest service property and soon arrive at the Anna Ruby Falls Visitor Center. Here is where you pay your $3 recreation use fee (per person, 16 and older; free for kids under 16) and access the trailhead. Unicoi State Park is situated in the beautiful North Georgia mountains. It is approximately a 90 mile drive from Atlanta, which is a relatively pleasant 2 hour drive (plus whatever Atlanta traffic has to offer!) northeast of the city.